In a world of fabrication, intended deceit, accidental error and oblivious intellectual mediocrity it’s certainly a daunting task convincing others of the importance of asking questions let alone finding absolute truth in amongst the contradictive chaos that is human science and morality. We grow as individuals learning and developing traits, habits, facts and talents based on information that has come before us. Although our genes define the initial direction of our voyage, the information of existence that has been strained through the proverbial sieve of trial and error over millennia and how we decide to interpret it is what defines the humanity of our journey. Why do people seem to care so little about the interrogation of life’s greatest questions? Unfortunately fear of intrusion, confusion, error and ridicule from those too arrogant in their own beliefs is enough to halt many a young, timid and inquisitive mind. Throughout history, independent logic and self-expression toward science and understanding has been drastically repressed in an attempt to obtain and maintain peace and power. To do so little as question scientific fact and intellectual authority was and still is in some societies punishable by imprisonment and even death – as Galileo discovered with his insistent and public heliocentricism, without which who knows how long we’d have been wrong about the solar system, our own home. Courage in one’s own intelligence is the overall accomplishment here. Thankfully we’re now in an age where in most of the civilised world it’s notably less dangerous to question convention – so why not have more courage in doing so? If you have to protect a belief or a discovery by denouncing every factual question and curious threat against it, the very authenticity and certainty of the idea itself is irreparably flawed from the onset. What we understand as utter truth and fact is something that has stood up to aggressive logic and scrutiny time and time again. Why else would it prevail as an idea and why else would we want to believe it? A solid, tried and tested peer-reviewed theory is, over time, generally accepted until further discovery allows for a better theory. Even the big bang theory, a universally accepted and seemingly accurate explanation for the origin of all matter with any pre-existing time denoted as beyond comprehension – is gradually being replaced by other matter-spawning ideas such as the big bounce and grand-scale multiverse natural selection. There is no discovery too big to be improved upon. So what does all this teach us about questioning? Well, this teaches us that having both the confidence to question and the modesty to accept criticism are universal behaviours outside of human ego that will inevitably offer humans the best chance at developing useful ideas that will aid mankind as efficiently as possible. The bearers of new discoveries should be humble at the thought of their work potentially being used as a mere stepping stone to a better understanding of what will eventually be the truth. Narrow-minded scientists searching for prestigious titles jealously defending their life works in the face of logic remind me of the famous Mozart and Salieri rivalry, you’d think being a revolutionist would involve ultimate joy at finding the answer as a species and not just defending a broken hypothesis out of pride, but that’s human nature for you. As a young churchgoer I couldn’t help but ask my mother why we go to church on a Sunday and put money into the collection plate of an already tax-exempt institution when we drive past multiple homeless people and independent charity shops on our way there. There’s always either a logical explanation or a crucial flaw that needs to be addressed in a motif, both of which are brought up and discovered via questioning. We live in an era where as so-called intelligent life we struggle to avoid war and racism and allow billionaires, royals and groups of immoral government hierarchical suits to brush paths with those stricken with poverty and famine – we quite clearly do not know it all. You have the right to question anything you feel the need to, passionately. Turning previously undisclosed and important questions into public knowledge is how we make a change. We all possess a few pounds of cranial-based grey matter, a passion for achievement and a desire to be recognised and awarded for our abilities but; creation did not occur in 7 days, nor was the earth flat and yet these ideas were seen as fact until proven wrong and like many other fact-interrogations throughout history we have questioning to thank for this. Being wrong, understanding why and being ok with it are important characteristics that every human should learn to be at peace with. 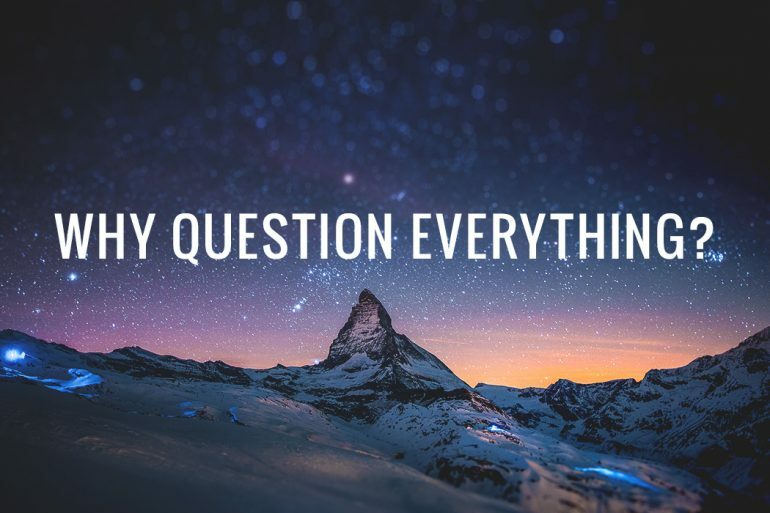 You may find yourself questioning topics that end up having very obvious answers but its far more important to question, be wrong and or embarrassed and to then learn from it than it is to pretend you know it all and to go through life arrogant and misinformed. The former will prevail as the representative of intelligence in the end. Questioning why you do everything forces you to pick apart the usefulness of habitual behaviours and to clarify aspects of your life and who you think you are almost like a daily mid-life crisis. If we were encouraged to maintain a child-like curiosity into our adult years we’d all grow up with a far better understanding of just how important it is to question why we do what we do which could potentially increase our happiness? People get incredibly complacent and trusting in established fact and theories therefore consider it beyond their place to question logic that has been verified by those that are seen by society as being more intelligent – but if the shoes doesn’t fit, don’t be afraid to return them. Personal arrogance and closed mindedness has led way to some of the most laughable decisions in recently history. From Decca records rejecting the Beatles in 1962 claiming guitar groups are on their way out, to IBM palming off Steve Jobs as a mere college student when being approached with designs for the first personal computer. Regardless of how smug you are about your own intelligence or accomplishments there are always handfuls of individuals that will pick up on what you’ve missed regardless of their apparent lack of seniority or IQ. No matter how right you think you are it’s important to question the opinions and theories of those that influence your own opinions. The more you know from the left and the right the more doors you open for your own personal happiness and so long as you teach others to question, happiness for them as well. Use logic completely void of arrogance and be patient and open minded, if this fails though, remember, anger and frustration are wasteful emotions, so accept it and move on to the next question. The meaning of life? The true answers to the questions that have plagued mankind since the dawn of human consciousness? No. Just the ramblings of a somewhat informed 20 something. Enjoy.